← A Moment of Panic…Western States 2015. It has been one of the most beautiful summers I can remember. Being relatively new to ultrarunning as well as having moved to Bath from London 18 months ago, I made the most of getting out and logging lots of miles on footpaths and trails. I spent many hours lost and backtracking, which allowed me to find some amazing routes. Living where I do I am extremely fortunate. Within a ten minute drive of my house I can run on the Cotswold Way, Palladian Way and Rideway. I have also recently discovered the Wessex Ridgeway a little further south. In addition there are thousands of footpaths and smaller routes. In short- I am spoiled for choice. During my summer exploring I ran almost exclusively in the Pearl Izumi Trail N1’s and Salomon Sense Ultra. These are both lightweight and relatively minimalist shoes, but with a good level of protection which doesn’t have you second guessing the terrain when running fast downhill. As summer turned to Autumn, I started to think about what I would use as the paths got wet and muddy and the above shoes would no longer be suitable for six months or so. Last winter I ran a lot in the Mizuno Wave Ascend which is an indestructible shoe yet a little on the heavy side, with plastic lugs that meant a lot of time picking myself up from falls. I will definitely be using these again this winter, but I wanted to try something lighter that would offer excellent grip and allow me to run fast to improve my speed. 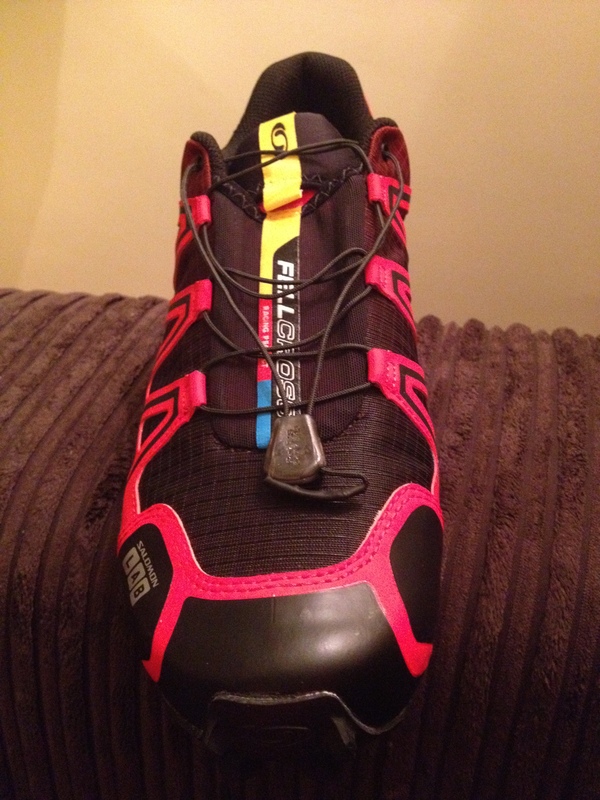 Looking at a range of options I came across the Salomon Fellcross. At first glance it almost looks like a football boot, with a thin body and aggressive lugs. I did some research and learned of how it was developed in partnership with Ricky Lightfoot, one of the UK’s top fell runners. 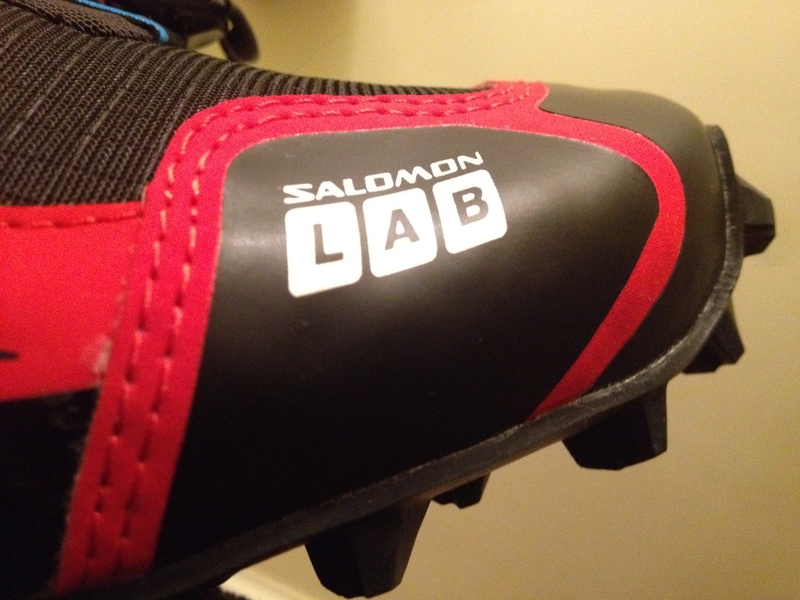 Knowing how the Salomon Sense was developed with Kilian Jornet I knew how much Salomon took input from their sponsored athletes and I opted to give this a go. This is summarised within the two tongues of the shoe where one says ‘Designed in the Alps’ and the other ‘Tested on the Fells’. The first thing I noticed about the shoe was how light it was. I really didn’t expect a shoe that is so well padded to be that light. At just 260 grams it felt as light as the Sense Ultra. The sole is made from EVA contragrip rubber which is very, very grippy. 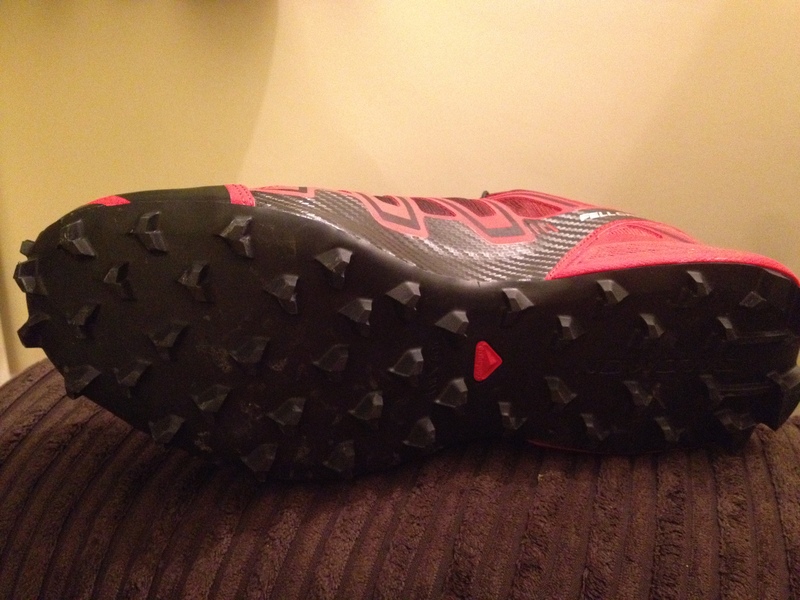 The lugs face forward at the front for uphill grip and backwards on the heel for downhill grip and I haven’t had any issues, aside from hitting wet tree roots, where any shoe would fail. Away from tree roots and wet rocks, in wet and boggy fields I have had no issue whatsoever and could run with confidence. The Fellcross is towards the low end of heel to toe drop at just 4mm and I felt my stride didn’t change at all from my summer shoes, which it does with the Wave Ascend. Like with most Salomon shoes, the quicklace system is in place and these tuck into the shoes tongue pocket, so there is no danger of laces coming undone during a run. The laces are extremely strong and I haven’t had any issues with them slipping from their set position. Once the shoe is on, it is a narrow fit which did take some getting used to. I am sure they will form to my foot over time, but having read other reviews some people have struggled with the narrowness although I didn’t find it uncomfortable, just a little more narrow than I am used to. Most of my run routes I try and go straight from my house and this does always incorporate an element of pavement and road. My biggest concern here was how these would fare on the road as they are the most aggressively lugged shoes I have owned. Aside from the fact that the rubber will ware down quicker, my biggest concern was slipping as they are simply not designed for tarmac. However, I was surprised at how well they gripped (pre-ice, that would be a different story I am sure). I felt a little like a pond skater as the lugs bend on hard surfaces and whilst I wouldn’t want to use them on the road for more than two or three miles, they are better than I expected. For longer runs on road and trail I wouldn’t use them, but they were never designed for that in the first place. These are definitely a racing shoe. 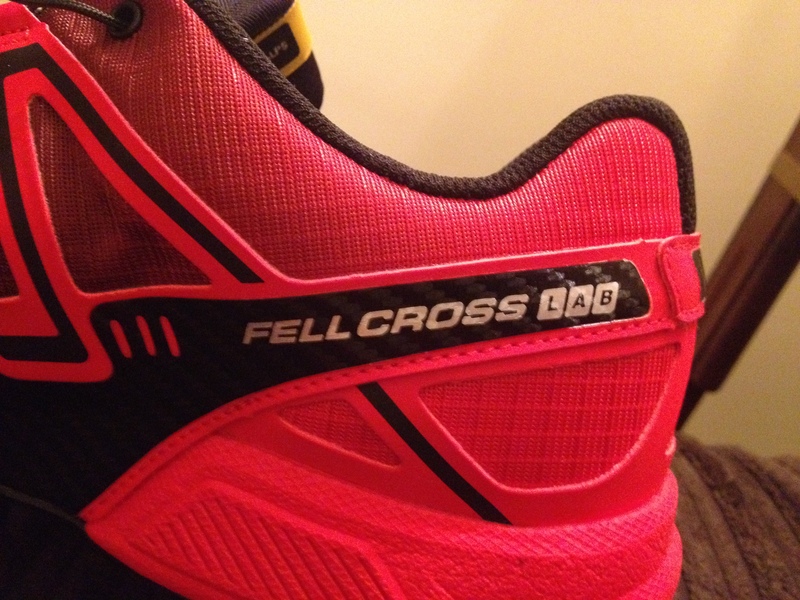 They allow a ridiculous level of grip, are extremely lightweight and now that the Fellcross 2 has been introduced for this winter, you can get the Fellcross 1 at a discounted price. From what I understand, the Fellcross 2 is even more lightweight and offers more protection but if you are not racing for the win I don’t see why you would need any other shoe than the original version. In two weeks time I am running the Brecon Beacons Ultra and I am likely to use these shoes. My concern is that they may not be 100% ideal as my feet swell over longer distances and I have only used these up to 18 miles so far. However, if the course is wet which it is likely to be, the grip offered by these compared with any of my other shoes will outweigh any of the potential discomfort. These would also be my shoe of choice on snow. In summary, if you are likely to be running in muddy conditions over the next few months, these are the perfect shoe up to the marathon and shorter ultra distance. 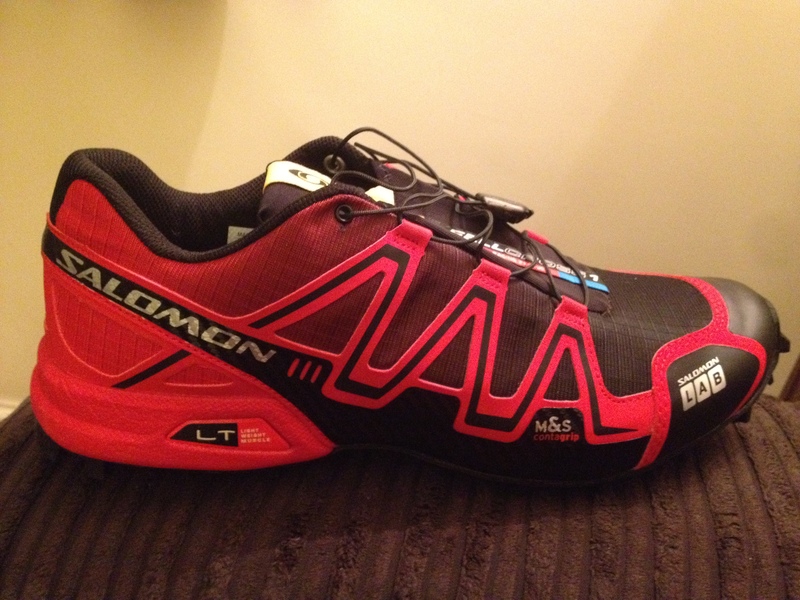 Longer than that, the forthcoming Salomon Sense Ultra Softground look fantastic. These are pretty much the same shoe as the original Sense Ultra, but with deeper lugs and I have no doubt will be extremely popular in the UK.